Description: Prostrate to erect shrubs to small trees. Leaves mostly alternate, sometimes oppostie or whorled, sessile or petiolate; margins entire, serrate or rarely deeply lobed. Flowers pollinated by birds or insects, caducous, 1–8 per axil, sessile or petiolate, developing in succession. 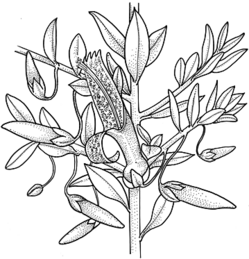 Sepals 5, occasionally 4. Corolla 2-lipped, tubular or campanulate, often curved. Stamen 4 (5) included or exserted. Ovary 2-locular becoming 4-locular by development of 2 placental septa. Fruits mostly dry or drupaceous and fleshy, cylindrical, top-shaped to globular; exocarp papery often separating from endocarp. Distribution and occurrence: A genus of 215 species widespread throughout Australia with the majority in Western Australia, absent from Tasmania and one species introduced in New Zealand.